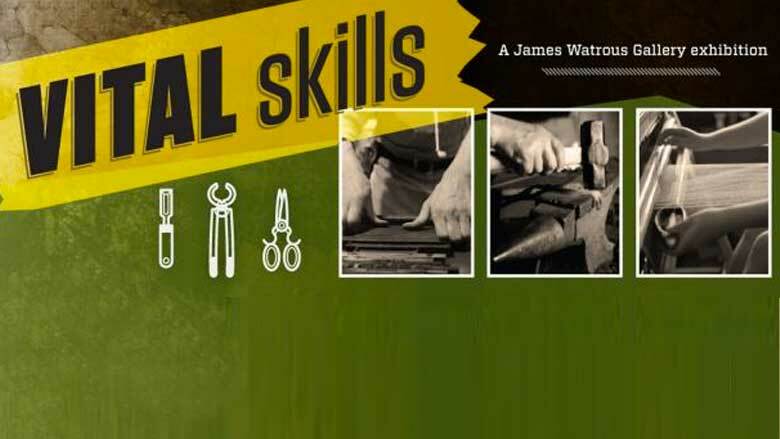 Vital Skills builds on the current interest in community resilience and "re-skilling" by bringing together the work of people who are preserving traditional hand skills in Wisconsin. In recent years local has become the watchword for many different concerns and efforts: creating sustainable food networks, maintaining healthy local economies, preserving regional traditions, and inculcating a sense of place. Being able to produce more goods locally creates jobs, economic resilience, and greater energy independence. While this focus on the local is overwhelmingly positive, it is often accompanied by a pervasive sense of gloom and doom about the future. The prospect of sudden and severe climate change, dwindling energy supplies, even worldwide economic collapse or global pandemic has created a sense of fear and uncertainty that permeates popular culture and political discourse. There's a reason zombies and vampires have captured the public imagination! This exhibit was developed in response to these trends and the current fascination with gardening, canning, beekeeping, and DIY crafts. The revival of these domestic skills isn't difficult: most can be taught, if not mastered, in a weekend. But our cultural memory for most pre-industrial skills is far more attenuated. Becoming a proficient blacksmith, knife-maker, or cobbler takes time, commitment, and—most crucially—a teacher who can share their knowledge in person. The individuals in this show are remarkably diverse, from basketmakers and boatbuilders dedicated to saving their cultural traditions, to professional artists with craft skills like papermaking, weaving, and engraving; metalsmiths who make props for historical reenactors; and custom shoemakers, gunsmiths, and leatherworkers who cater to the luxury market. Craft skills also survive in surprising niches, like university labs devoted to hand-blown scientific glass and letterpress print shops whose primary business is wedding invitations. Vital Skills will celebrate their commitment, mastery, and deep reserve of knowledge and experience, and explore the role they might play in creating a truly resilient local economy. Read Jody Clowes' article about this project in the winter issue of Wisconsin People & Ideas. Vital Skills is supported in part by grants from Dane Arts and the Wisconsin Humanities Council, with funds from the National Endowment for the Humanities and the State of Wisconsin. Mike Coughlin's primary business is letterpress wedding invitations and birth announcements, and he also carries on the tradition of publishing broadsides and pamphlets that reflect his personal and political concerns. Greg David is a designer, builder, and enthusiastic proponent of small-scale energy systems. He creates rocket stoves, simple devices that efficiently burn "waste" wood for cooking, heating, and powering engines. The stoves are designed so that a few handfuls of twigs or wood chips provide enough fuel to cook a meal. Benjamyn Deneen developed an interest in metalworking when he began working with a blacksmith as a teenager. After he returned from Iraq in 2007, he decided to turn his passion for metalworking into a business. Deneen is dedicated to sustainability, preferring to work with reclaimed steel and sustainably harvested woods. Motorcycle enthusiasts Max and Donna Doering sold their shoe repair shop in the 1980s so that Max could devote his time to making custom leather saddlebags. Their business has grown steadily, but each saddlebag is still designed by Max and entirely handmade in their shop. Scientific glassblower Tracy Drier creates precision lab instruments which are used for scientific research by the Department of Chemistry at UW-Madison. While there are many skilled glass artists in Wisconsin, few have the training and understanding to work in partnership with scientists. Willen Gebben's Hillcrest Pottery is located on an old farmstead in rural Colfax, Wisconsin. Making pottery is relatively energy-intensive, but Gebben strives to make his workshop as efficient as possible. He slakes his clay in large tubs, throws the pots on a foot-powered kickwheel, and single-fires them in a wood-fired kiln. Martha Glowacki is a sculptor and installation artists whose work is shown on a regional and national level. She is particularly interested in the intersections between visual art and the natural sciences. Mary Hark creates linen and flax papers for use in her own artwork, and her papers are also sought after by other artists, letterpress printers, and bookbinders. Since 2006, Hark has also worked with colleagues in Kumasi, Ghana to develop high-quality papers using pulp-mulberry, an invasive plant introduced from China in the 1960s. "Little" John Holzwart makes brooms, cordage, and rustic furniture, inspired by natural materials and a desire to make beautiful, useful things from renewable resources. In addition to branches, he uses shed antlers, wrought iron, and even old guitar necks to form the handles of his brooms. Gregory Hunt makes exquisite custom show harnesses for clients around the world. While the luxury market has kept a small pool of specialized workshops like Hunt's in business, just two generations ago virtually every town supported a harness-maker. Greg Johnson is an artist dedicated to preserving and passing on the Ojibwe tradition, from hunting and beadwork to speaking Ojibwemowin. He taught himself to make moccasins by taking apart a pair of his grandmother's, and brain-tans the hides from animals he hunts himself. Bill and Donna Kallner run a fishing net-making business in White Lake. Before buying the business, they operated a kayak and canoe school and paddling store. It takes about two weeks to craft each net, using materials provided by a custom cut-and-sew business in Tennessee. Wence Martinez learned traditional weaving in Oaxaca before going to art school in Mexico City. He creates tapestries based on his own pattern-driven designs, often influenced by his wife Sandra’s abstract drawings. Martinez prides himself on working with hand-spun wool from Oaxaca. Eric Moebius began working with iron in the 1970s, and has established an international reputation as a master blacksmith. He specializes in architectural commissions, making everything from railings and gates to lighting fixtures, furniture, and signs. Sam Rust, a gunsmith out of Rice Lake, first learned to carve and fit gunstocks as a boy from his uncles. His work embodies respect for the hunting tradition and is sought by collectors as well as local hunters. Best known for his color wood engravings, Gaylord Schanilec has set the standard for contemporary artist’s books over the last forty years. His widely collected and unique fine press books explore his interests and experiences as well as his hometown landscape and community. Mary Lou Schneider, a decoy carver from Fond du Lac, grew up spearing sturgeon on the ice at Lake Winnebago. Now her family is closely involved in the successful effort to restore the sturgeon population. Decoys are essential for luring sturgeon and bottom feeders up to the lake's surface. Bob Siegel, a wooden shoe carver based in Mequon, is one of the very few wooden shoe carvers in the U.S. While wooden shoes may seem like a complete anachronism, their revival was important when leather was in short supply during WWI — and there's nothing like them on damp or muddy ground. Philip Simeon, a fisherman from St. Lucia, began weaving traps from natural materials and weighted with stones for use on the ocean floor. He also wove smaller items for sale to tourists. In Madison, Simeon keeps his skills sharp by weaving salvaged plastic strapping, which is readily available but much more difficult to weave. Jarrod Stone-Dahl is inspired by the woodworking traditions of his Scandinavian ancestors and the indigenous people of the Wisconsin northwoods, where he grew up. It is important to him to work with traditional materials and hand tools like crooked knives and foot-powered lathes. April Stone-Dahl is a member of the Bad River Band of Lake Superior Ojibwe. She taught herself to make black ash baskets before realizing how few northern Ojibwe still knew how to weave them. Alisa Toninato is a sculptor and patternmaker based in Madison. Pouring hot iron is exciting, but Toninato maintains that the most important part of her work is making the patterns. The originals are carved from laminated wood, from which more durable working patterns can be cast in plastic. Jeff Trapp got his start as a boat-builder before becoming fascinated by the simplicity and elegance of Windsor chairs. He harvests his own woods in northern Wisconsin, works with traditional hand tools, and finishes the chairs with milk paints and hand-rubbed oil. Tong Khai Vang is a blacksmith in the LaCrosse Hmong Mutual Assistance Association blacksmith shop which opened in 2001, giving elders a place to practice and teach their skills. It has become an important social hub and a source of local pride.